Michael Smart / For Shaw Media Cary-Grove's #7 Luis Lemus celebrates after scoring a goal against Prairie Ridge during varsity boys soccer at Prairie Ridge Tuesday, September 9, 2014. Cary-Grove won 4-2. 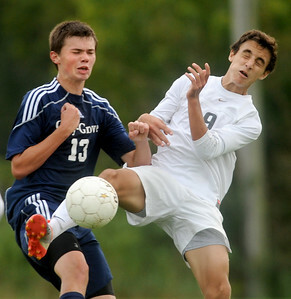 Michael Smart / For Shaw Media Cary-Grove's #13 Patrick McKune (left) battles with Prairie Ridge's #9 Dominik Chece during varsity boys soccer at Prairie Ridge Tuesday, September 9, 2014. 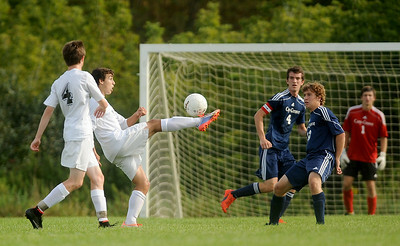 Michael Smart / For Shaw Media Cary-Grove at Prairie Ridge boys soccer, September 9, 2014. 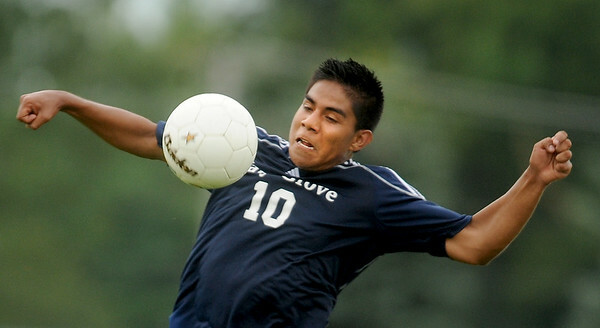 Michael Smart / For Shaw Media Cary-Grove's #10 Israel Lopez gets his chest on the ball during a game against Prairie Ridge in varsity boys soccer at Prairie Ridge Tuesday, September 9, 2014. 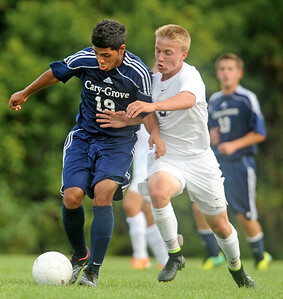 Michael Smart / For Shaw Media Cary-Grove's #19 Esteban Angeles battles with Prairie Ridge's #5 Nick Hoklas during varsity boys soccer at Prairie Ridge in Crystal Lake, Tuesday, September 9, 2014. 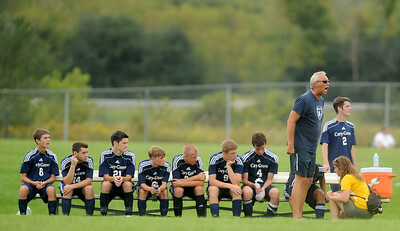 Michael Smart / For Shaw Media Cary-Grove Varsity Head Coach Mark Olson yells instructions to his team during a boys soccer game against Prairie Ridge, September 9, 2014. 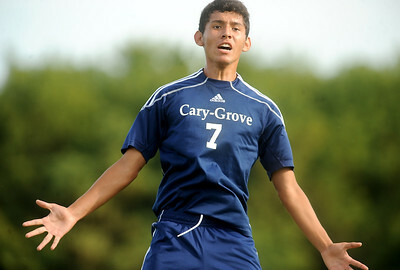 Cary-Grove won 4-2. Michael Smart / For Shaw Media Prairie Ridge's #4 Josh Reichert (from left) watches his teammate #9 Dominik Chece try to kick pass Cary-Grove's #4 Bradley Sigsworth, #12 Matthew Scott and goalie #1 Dezso Ethan Csoka during varsity boys soccer at Prairie Ridge Tuesday, September 9, 2014. 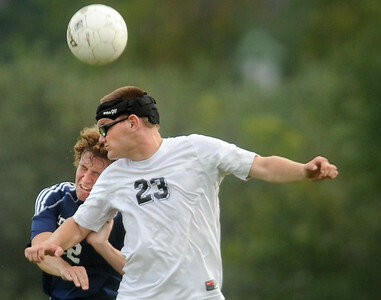 Michael Smart / For Shaw Media Prairie Ridge's #4 Josh Reichert (left) struggles with Cary-Grove's #3 Michael Arenberg at Prairie Ridge boys soccer Tuesday, September 9, 2014. 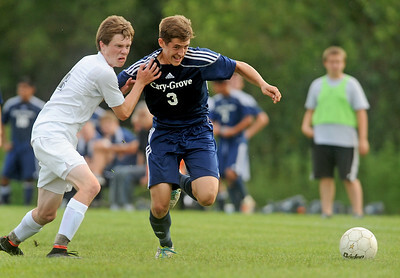 Cary-Grove's #13 Patrick McKune (left) battles with Prairie Ridge's #9 Dominik Chece during varsity boys soccer at Prairie Ridge Tuesday, September 9, 2014.